I am fortunate enough to have spent my life on or around the water. I grew up in a Coast Guard family, and was introduced to the salt at a very young age. Once I could hold a fishing rod, there wasn't much that could break that grip. Being around the ocean, and having the pleasure to cut my teeth fishing the Florida Keys fueled a lifelong passion for chasing saltwater fish. I've have been blessed with the experience of fishing the deepest waters of the Gulf Stream south of Key West, the shallow flats of the lower keys, the grouper grounds of the north Florida Gulf, and the amazing fishery of Florida Bay and the Everglades. 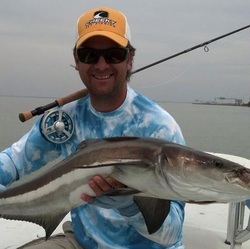 My passion for the saltwater environment and the fishery is what I aim to share with my anglers.